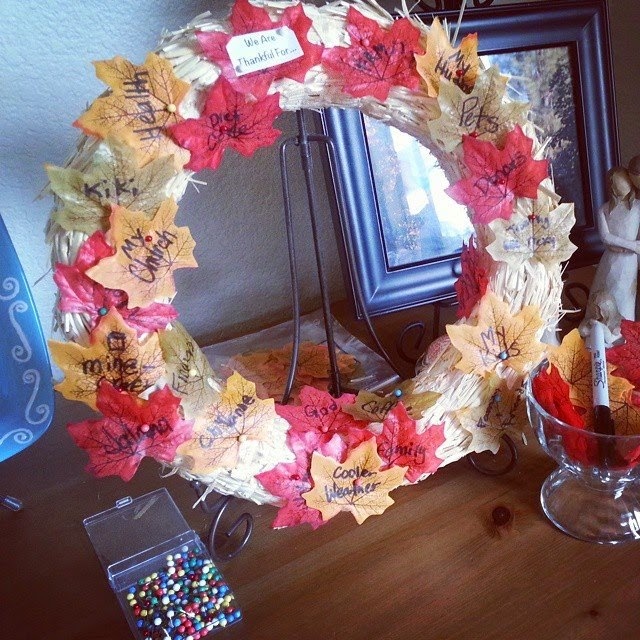 If you are looking for a low stress and frugal way to usher in an attitude of gratitude this Thanksgiving holiday season then you are going to love this simple and easy thankful wreath idea. My friend Andi made this thankful wreath with her family and I couldn't wait to share it with you. She was inspired by and put a creative spin on a paper thanksgiving wreath she had seen and I just love what she did. It's eye catching, simple and easy to get the whole family participating. 2-3 packs of fabric leaves. Hers are from the dollar store. Place the wreath on the iron stand. Have your family write what they are thankful for on the fabric leaves and pin them around the wreath using the map pins. Keep it going all season long. That's it! It would be a wonderful and easy thanksgiving family tradition to keep for years to come!